So for Christmas my husband and I got each other a stocking filled with stuff we knew the other would love. I got an assortment of chocolates, gum, and Sephora gift cards! He actually got me a $25 one then hid another $25 one somewhere else (sneaky husband)! Anyway I've never been into the Sephora store in my area since they opened it so I figured I'd go check it out and maybe save some shipping cost. I went in not sure what I wanted and since it was just a small store inside the JCPenny at the mall I knew they didn't carry everything an actual freestanding store would carry. I was checking out things like the True Blood Palette, the Urban Decay Book of Shadows IV, and Kat Von D stuff. I happened to pass by an end cap that had a sign that said $6.77, and on that shelf I saw about 10 - 15 Kat Von D Metal Orchestra Palettes. I did a double take when I saw that and headed towards the closest employee. She was really nice and told me right away that it was the correct price for the palette! They were originally $34 each but are now marked down to just $6.77!!!! So I did what any makeup girl would do, I grabbed 3 of them and tried to decide if I wanted to grab them all! I ended up getting 3 of them so I could of course have a giveaway with them for my lovely readers! I may just have to go back to get more this weekend lol. Anyway I couldn't exactly go out and tell my wonderful husband that I spent all of the Christmas money he gave me on giveaway prizes, so I still had to find something I could walk away with that I was keeping! I browsed for what seemed like forever and finally after several passes ended up grabbing the Urban Decay Book of Shadows IV. I would have passed it because I think $64 is a bit much for something that I've heard some people say wasn't up to par, but they had it on sale for just $44 and I figured why not! Anyway as I was standing in line to check out I ended up seeing cute little Tokidoki mint cases and grabbed 2 of them. As the girl was checking out my things she complimented me on my winged liner and hot pink lips! I was wearing Morgana Cryptoria Lipstick in Valentine with some crazy winged liner, she was sweet and said "a girl after my own heart wearing winged liner and hot pink lips!" It's nice to get compliments from MUA's. When she finished ringing me up she said "you saved $109 today!" I was like OMG!!! So when I got to the car I told the husband and then began scanning the receipt, apparently the Tokidoki mints used to be $5 each! I mean come on they are mints!! I got them for $0.97 a piece and should have grabbed more (for giveaways of course)! 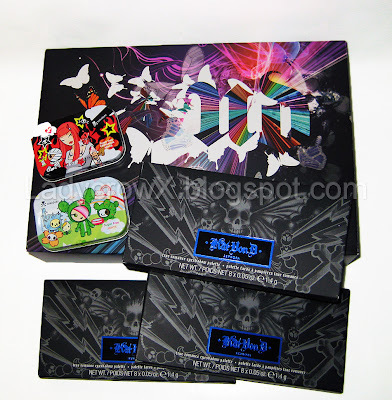 So enough rambling, keep an eye out for upcoming giveaways with the Kat Von D Metal Orchestra palette, and hopefully some Tokidoki mint tins! Can you believe I got all these for $70?!?! Anyway I'm coming down with some sort of cold/sore throat so I'm off for the night, I will try to finish up some reviews once I feel better. Do you own the UD BoSIV? What do you think of it? Love it or Leave it? I wonder why they don't have the same promotion online. Kat Von D palettes are amazing but they're $18 online. Strange! Congrats going to your first Sephora, you're going to be hooked now! @Glamour Doll Eyes I know! I just bought my Kat Von D palette a few weeks ago for $24 online too. I seem to always find stuff on sale after I just buy it lol! i'm usually an Ulta girl but I also got a Sephora gift card for Christmas, and it will be my first time shopping in there, too! I've been eyeing the Kat Von D palettes, as well! @simply beauty I'm curious if all the actual Sephora's have the palette for that deal! I got the Book of Shadows IV, because I had a major windfall (my relatives remembered me this year! ), and I love it! It's mostly nudes and safe-for-work colors, but that's okay. I also really liked the sample mascara they included. I went out and bought a full-size today. Whoa, that's a SERIOUSLY amazing deal!